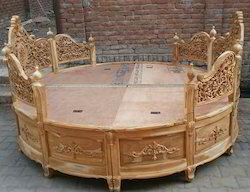 Wooden Double Bed is carved beautiful and made from teak wood. This is available in various designs and looks. This wooden double bed with storage is made from solid oak wood. This product is in line with latest market trends. 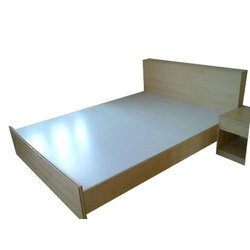 This is simple and classical double size bed design. This product is made from good quality wood. This product has special features such as hydraulic jack, Steel Support, Stainless Steel Legs. This product has perfect finish, designs and attractive looks. This products is used as a place to sleep or relax. Dimensions: HB.H - 42", L - 83", W - 75", FB.H - 17"
Our company holds vast experience in this domain and is involved in offering Stylish Double Bed.